Joe Blasenstein loved basketball, but when he went to West Philadelphia High School in 1956 a friend and former star football player told the football coach to recruit Joe. He started out as a 165-170 pound offensive guard and linebacker on defense. He came to like the role of the offensive guard, pulling and leading sweeps and traps. In 1957 he was named All Public and Second Team All Interscholastic. The next year he was First Team All Public and All Interscholastic. Joe was awarded a football scholarship to Penn State University. After the required year on the Freshman team, Joe became a starting guard on several very strong Penn State teams. 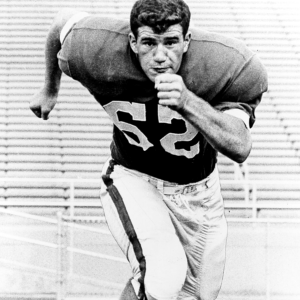 He played in three straight bowl games for Penn State, beginning in 1960 when the Lions finished the season ranked No. 16 and then defeated Oregon in the Liberty Bowl. The following year, Joe was named Associated Press (AP) All-East Third Team as Penn State finished the season ranked No. 17, defeating No. 13 Georgia Tech in the Gator Bowl. In his final year, Joe was named AP and United Press International (UPI) All-America honorable mention and AP All-East second team. No. 9 Penn State returned to the Gator Bowl, where they lost to Florida. In 1961 and 1962, Penn State was awarded the Lambert-Meadowlands Trophy as the top team in the East. After graduating from Penn State, Joe played professional football in Canada for a short time before deciding to pursue a teaching career. He became a teacher in Cinnaminson, New Jersey.